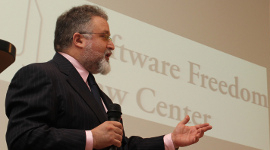 October 3, 2013 by Karl Fogel 0 comments on "Eben Moglen talks in New York City: “Snowden and the Future”"
Arrgh, I wish I could go to this! Eben Moglen is giving a series of talks entitled “Snowden and the Future” on four Wednesday nights, spread across October, November, and December. I’d even fly into New York to attend some of them, but I have choir rehearsal on Wednesday nights (and I’ve already missed rehearsals due to travel, so don’t want to do more of that). But if you’re in New York, you should go! They’ll be at Columbia Law School, Jerome Greene Hall room 101 (map), from 4:30pm – 5:30pm, on Wednesdays Oct 9th, Oct 30th, Nov 13th, and Dec 4th. More information at snowdenandthefuture.info. The talks will be live-streamed at that site too. Previous Previous post: Dear Lazyweb: How long will it take you to fix the LOVEINT problem? Next Next post: My Contempt Knows No Bounds: The Starbucks “Come Together” Petition.